Today a co-worker had a little get together after work. She called it "Sandals and Sangria". I call it a great finish to a busy day. I made these for her as a little treat. Super yummy, creamy and refreshing. Preheat oven to 325 degrees. Line 10x10 pan with parchment that hangs over the edges. Mix the butter and graham crackers together and press into the bottom of the pan evenly. Bake crust for 5 minutes and allow to cool completely. 3/4 cup lime curd (from recipe below or premade). Divided. Beat butter and sugar in a large bowl using an electric mixer. Slowly add the eggs and yolks one at a time, mixing well after each addition. Pour in lime juice and mix again. Expect the mixture to look curdled, this is normal. Cook the mixture over medium heat in a medium-size saucepan until it looks smooth (no longer curdled.) Increase the heat slightly and cook, whisking constantly, until the mixture thickens. Clip a thermometer to the side of the pan and cook until the mixture reaches 170 degrees. Remove the curd from the heat. Transfer the curd to a bowl and press plastic wrap on the surface of the lime curd to keep a skin from forming. Chill the curd in the refrigerator. The curd will thicken further as it cools. Covered tightly, it will keep in the refrigerator for a week and in the freezer for 2 months. Tint the 3/4 cup of lime curd with food coloring until lime-rind green. Set lime curd aside. Beat cream cheese and sugar in large bowl with mixer on medium high until smooth. Beat in eggs on low speed one at a time. Beat in the sour cream and vanilla then flour just until blended. Remove 1 cup of batter and reserve. Pour the rest of the batter over crust. Mix 1/2 cup of tinted lime curd with the 1 cup of reserved batter. 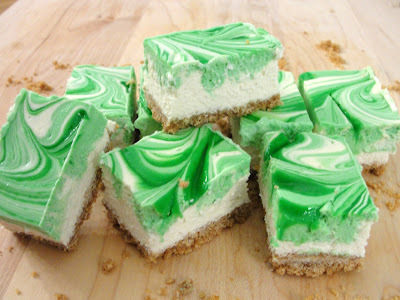 Place spoonful or dollops of this mixture, in no particular fashion, on top of the plain cheesecake batter. Dollop the remaining 1/4 cup of lime curd across the previous mixture. Use a skewer or butter knife to swirl the mixtures together to create a marbleized effect. Bake for 35 minutes at 325 degrees. Let cool completely in pan and then refrigerate. Lift cheesecake out of the pan with parchment. Cut into bars. * I used premade lime curd.